Home » Uncategorized » Did Jesus Offer Sacrifices at the Temple? 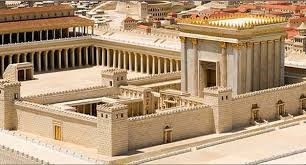 Recently someone asked me this question: Did Jesus offer sacrifices at the Jerusalem temple? I thought it was a great question so I thought I’d attempt to address it. Now to answer it properly would take more time and space than I have, but let me at least point toward an answer. The question is a historical question not one based on any particular theological agenda. How likely is it that Jesus of Nazareth would have made pilgrimage to the temple and offered a sacrifice or sacrifices there? Now the Gospels make it clear that Jesus did go the temple on occasion as a child and as an adult, but there is no account of Jesus himself actually offering a sacrifice at the temple. That may not mean that Jesus did not offer a sacrifice while there. Now the main activity of the temple was sacrifice. That is why there were 24 courses of priests. Technically, only priests offered sacrifices but the sacrifices were provided by worshipers, usually male head of households. The worshipers brought the sacrifices (animals, wine, grain, etc) to the prescribed place and handed them over to the priests. The temple was a busy place. According to the law, the sacrificial system had been established by God; it was therefore good (Psalm 119). Even if some of the prophets had railed against empty ritual and ethical lapses, they did not condemn the temple itself and sacrifices wholesale (e.g., Amos 5:21-27). Almost universally, it was the temple leadership who got an earful from the Jerusalem prophets. But we must remember that not all sacrifices were “sin” or “guilt” offerings. Many sacrifices were for peace offerings, fellowship offerings, votive offerings, offerings of consecration. Let’s consider a few episodes from the New Testament and see if they shed any light on our question. After Jesus is born and the time of Mary’s menstrual impurity had run its course, Luke reports that Mary and Joseph took the baby Jesus to Jerusalem to present him to the Lord at the temple. This was in keeping with Mosaic law (Leviticus 12.6-8). We’re told they offered a sacrifice in accordance with the law, a pair of two young pigeons (Lev 5.11). When Jesus healed the leper (Mark 1:40-45), he instructed him to go to the priest and offer for his cleansing what Moses commanded (Leviticus 14:1-32). The declaration that a leper was cleansed involved sacrifices in the temple. Would Jesus have directed the man to go to the temple and sacrifice if he was teaching his disciples to neglect the temple worship completely? And there is the matter of the temple tax (Matthew 17:24-27). The tax collectors seek out Jesus and his disciples in Capernaum. They appear to frame the question as if they expected Jesus to somehow object. Perhaps Jesus’ teachings and actions had aroused their suspicions. But Peter lets them know in no uncertain terms that did pay the temple tax. The tax is described in Exodus 30:11-16 as a half a shekel “a contribution to the LORD.” When Peter approached Jesus at home, Jesus appears to claim exemption; but in order not to make waves Jesus instructs Peter to go fishing. And when he does he catches a fish that had swallowed a coin worth enough to pay the annual temple tax for both of them. The temple tax was used for the upkeep of the temple which included the sacrifices. Then, there is the Last Supper which many consider a Passover meal (though there are debates about it). John, for example, has Jesus crucified on the day of preparation for the Passover (19:31). But there may have been calendrical debates going on at the time because Mark (14:12-25) and the Synoptics present it as a Passover meal. Jesus sends two of his disciples into the city to make preparations which likely included securing a place for the meal and securing the food itself which would have included the lamb from the temple. Even if Jesus himself did not sacrifice in the temple, he had others do it for him. This suggests he had no argument in principle with the sacrifices. But what about the temple incident (Mark 11:15-19 and par.)? I’ve written about that elsewhere. As a prophet, Jesus is enacting (God’s) judgment upon the temple and predicting its destruction. An event which happens in AD 70. Essentially, the operation of the temple had become robbery under the temple authorities, and the place where the Gentiles were allowed to gather and worship was overrun by animals and merchants. The sanctity of the temple and its purpose had been lost. The problem was not the sacrifices themselves—they had been set up and ordained by God—the problem was with those who superintended the temple. So what are we to make of this? In the end I see no reason to deny that Jesus like any good Jew of his day would have made pilgrimages to the temple and offered sacrifices there. Based on Hebrews some may wish to conclude that Jesus did not offered sin sacrifices, but there were other ranks of offerings and sacrifices which the righteous Jew could and should make at the temple. Finally, when opponents accused Jesus of trying to abolish the law and the prophets (Matthew 5:17), he claims boldly he comes to fulfill them not to neglect or abolish them. Nothing could be more central to the law than the sacrifices. By David B. Capes in Uncategorized on February 14, 2014 . Isn’t all of that true only up until the time that Jesus himself becomes the ultimate sacrifice? Everything you listed is, of course, prior to that happening. Jim, indeed. Jesus’ could not have sacrificed at the temple after he was executed. But did early Jesus-followers go to the temple and then offer any kind of sacrifice. Acts indicates they continue to go to the temple. It does say they went to the temple, but never says they sacrifices. It does say they taught – about Jesus who is the final and complete sacrifice. Certainly no sin sacrifices would have been offered. Perhaps some of the others.. but I don’t think so. Why? Because we are the temple of the Holy Spirit, no longer the building.We are the temple – and sacrifices (of a holy life) are what we offer with our bodies and lives. Sacrifices are indeed offered at the temple, but it is now “us” . The Ascents of James is not cannonized, ascribed as it is to Jewish Christians (which one would suspect to be the nature of the earliest Church). It goes into length about the replacement of animal sacrifice with baptism. Which was a threat to the income of the Sadducees who ran them temple, and could well explain their anger when Jesus expelled the seller of doves. James says that Moses, having caught the freed jews sacrificing to Egyptian gods, gauged that turning this primitive impulse back towards honoring God as a necessary intermediate step, but that the practice would end with coming of the Messiah. But sacrifices for GOD of Abraham away much before Moses were a practice, wasn’t in? Sorry, but I didn’t follow the question. I am curious as to why there is no debate recorded in Acts about stopping the practice of offering sacrifices. We follow the debates about circumcision and following the food restrictions but nothing about the early church struggling with the practice of offering a sacrifice. Any thoughts. Jane, That is a good question. We know from Acts that Jesus-followers continued to go to the temple. But whether they sacrificed, we don’t know. There are no debates, from what I can tell, about sacrifices. That might be a good PhD thesis! It must have been obvious to anyone who had heard the central Good News preached that now no blood sacrifices were of any use, since Christ fulfilled their very purpose. I don’t see what anyone could have debated about, unless they were expressly rejecting Christ’s Sacrifice. It would have probably looked like they were simply creating an entirely new religion with no basis in Judaism if they had not continued going to the Temple. But I’m not an authority, just a Catholic who submits to the Church’s teaching. Any sort of animal sacrifice was a blood sacrifice since the life of the animal was offered, but not all blood sacrifices were sin sacrifices. There is a difference.